There's been a lot of speculation about whether augmented reality or virtual reality will be "the next big thing." A new report from Digi-Capital suggests that both technologies will hit it big, but one considerably moreso than the other. 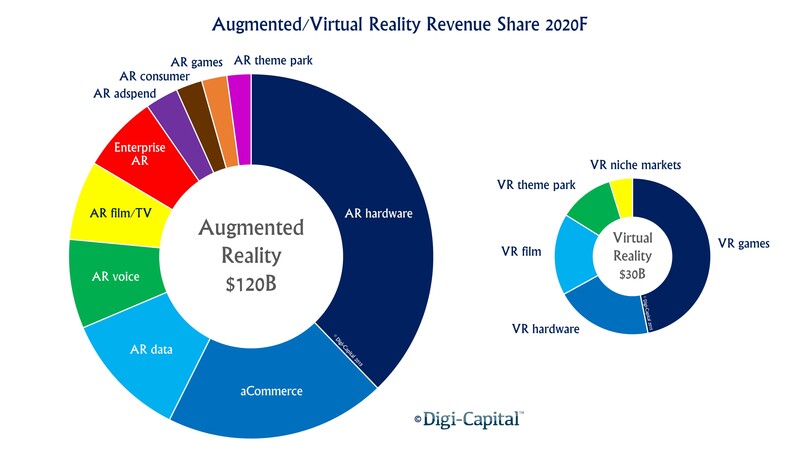 According to the firm, AR and VR will grow into a $150 billion market by 2020, with AR claiming $120 billion of that total compared to VR's $30 billion. The revenue discrepancy between the two technologies can be attributed to the way users experience then. Digi-Capital said the quality that makes VR attractive to gamers--a completely immersive and closed experience--limits its reach beyond that crowd. "VR is great for games and 3D films - that's what it was designed for," said Digi-Capital managing director Tim Merel. "However it is primarily a living room, office or seated experience, as you might bump into things if you walked down the street wearing a closed headset... AR is great fun for games, but maybe not as much fun as VR when true immersion is required - think mobile versus console games. But that possible weakness for gamers is exactly why AR has the potential to play the same role in our lives as mobile phones with hundreds of millions of users. You could wear it anywhere, doing anything (well maybe not some things - that wouldn't be polite)." Even though games are typically featured as a selling point for AR tech demos, Digi-Capital believes they represent just a small part of the potential market for the technology. "AR software and services could have similar economics to today's mobile market, as they both cannibalize and grow it," Merel said. "A large AR user base would be a major revenue source for TV/film, enterprise, advertising, and consumer apps from Facebook to Uber to Clash of Clans. Amazon and Alibaba would have an entirely new platform for selling to a mass audience. Together with innovative applications nobody has thought of yet, AR's scale could prove a bonanza for mobile networks' voice and data businesses. Someone has to pay for all that mobile data." Merel noted a number of exciting moments in the evolution of VR and AR to date--from Google Glass to Facebook's acquisition of Oculus to Microsoft's debut of HoloLens--but suggested the truly big thing for "the next big thing" may not have happened yet. "There are amazing early stage platforms and apps, but VR/AR in 2015 feels a bit like the smartphone market before the iPhone," Merel said. "We're waiting for someone to say 'One more thing...' in a way that has everyone thinking 'so that's where the market's going!'" Hang on. Those markets will barely even exist as of the end of 2015, they acknowledge that not much is know application wise so far and yet they predict up to $150 billion in revenue in less than 5 years? There is speculation and then there is this. I "project" (sounds so much more convincing than "predict") that by 2020, market analysts will rake in 500% more money than they already do, coming up with numbers out of thin air. Dan, maybe I should stop studying networking (I plan to develop new online infrastructure technologies) and get into market analysis. With networking, precision is paramount...accuracy is required. With market analysis, headlines are paramount...accuracy be damned. I imagine there's actually a lot of genuinely complex analysis that goes on in market analysis, but that seems to have very little to do with what makes the headlines, and I also get the distinct feeling that like a lot of financial and legal related industries, the whole discipline seems designed primarily to endlessly justify and perpetuate its own importance. This is why I am so thankful for being part of an industry that actually creates things. Money be damned, I'd sooner be an artist or engineer any day! And only $499 to read the report!